There are over a thousand different varieties of mint. Ginger mint (Mentha x gracilis syn. Mentha x gentilis) is a cross between corn mint and spearmint, and smells very much like spearmint. Often called slender mint or scotch mint, variegated ginger mint plants have beautiful bright yellow stripes on the leaves. Let’s learn more about growing ginger mint plants. Ginger mint, like all other varieties of mint, is easy to grow and can quickly get out of hand when allowed to grow freely. If you have the space to let your mint plants run, it will kindly oblige. Otherwise, it’s best to contain it in a pot of some kind. To keep growth under control, you can even cut the bottom out of large coffee can and place this in the ground. This mint is not particularly picky about the soil it grows in as long as it is not too dry. Ginger mint will even grow well in heavy soils loaded with clay. Place plants in a sunny or partly sunny location for best results. If you plant your mint in a container, be sure to keep the soil amply moist. Containers dry out quickly in the hot summer heat. Check the soil a couple of times a week to be sure that it is moist to touch. Ginger mint in the garden will appreciate a generous layer of mulch. Use garden compost, bark chips, cocoa shells or other finely shredded compost. This will help to retain moisture and protect the ginger mint herbs over the winter. Feed your plants with bone meal twice a year for best performance. 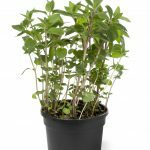 To keep your mints plants looking their best, clip the older woody stems back to allow younger shoots to fill in. In late fall, cut the plants back to the ground. This protects the plant and allow vital energy to be put into new growth for the following season. Harvest young shoots as they appear in the spring. Always collect mint leaves on a dry day before the hot sun comes out and use right away for best taste. Division is easily accomplished any time of the year; however, spring or fall is best. Any part of the root will grow a new plant. Ginger mint herbs are a delightful addition to fresh summer melon salads, as well as warm or cool teas and lemonade. Finely chopped pieces of mint can be added to softened butter for a delicious spread. Fresh grilled meats taste great with a lemon juice and mint leaf marinade.